Obadiah, the shortest book in the Old Testament, is a prophecy of judgment against Edom and a prophecy of restoration for the house of Israel. It is what Israel and Edom represent that is of greatest interest to us. Israel, of course, represents spiritual Israel, the Church of the Lord Jesus Christ. Edom represents Mystery Babylon, the lukewarm and half-hearted portion of Christianity. 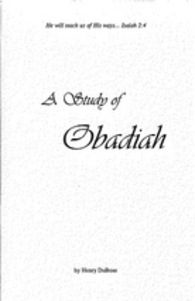 An exposition of the Book of Obadiah.